StockPair have ceased offering binary options. The firm is no longer accepting new accounts. Stockpair offers both standard binary options trading as well as pair trades where assets can be backed to outperform one another. The firm are a major player in the binary options market, and continue to grow. Operated by a team composed of technical, risk management and investment professionals. The platform has been designed to offer an easy to understand trading environment. Stockpair provide trading tools on mobile, smart phones and tablets and continue to develop their offerings. They are a leading binary options brand. Stockpair provide a simple trading window, focusing on one trade (as opposed to juggling multiple positions). Both binaries and pairs are available via tabs. The list of assets are then listed beneath in a clear and user friendly way. Below the trading arrows is a price graph, and then a ‘sentiment’ bar which indicates the way traders suspect the price will move. Payout and expiry times are very clear and it is a simple uncluttered interface to use. Stockpair list options on forex, commodities, stocks and indices. As the name suggests, Stockpair tend to focus on stocks. They have a very strong range of stocks listed, from the US, Europe and Australia. 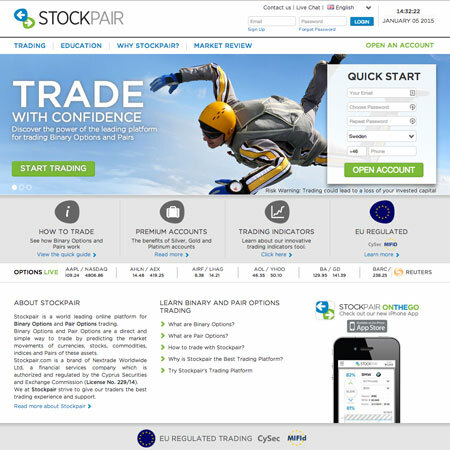 Traders looking to trade mainly company stocks, will find Stockpair provide a very comprehensive list. All the popular and more widely traded assets exist in the forex and commodities list, but more exotic options may not be available. Stockpair typically offer a maximum return of 75% on options. This rate can vary depending on the asset and expiry time. Pairs – Pairs are not provided by all brokers, and Stockpair are one of the leading pair brokerages. Stock ranges – The list of stocks provided for trade is very large at Stockpair, in comparison to other brokers. On the go – Stockpair offer a mobile app from trading branded ‘On the go’.